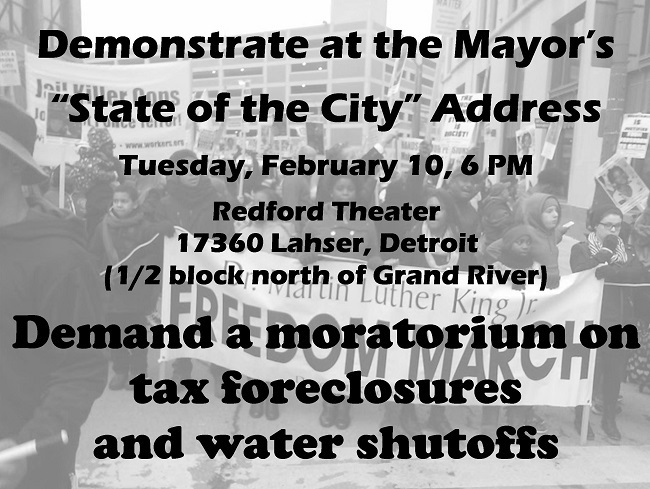 Stop Foreclosures! Stop Water Shutoffs Now! An estimated 62,000 homes, affecting more than 120,000 people, are slated to go into property tax foreclosure in the coming months. Water shutoffs continue unabated, even during the winter months. And some City of Detroit retirees now face losing their homes after having pensions and health benefits cut drastically. The right-wing Synder government in Lansing refuses to utilize hundreds of millions of dollars in federal housing assistance funds available in Michigan, called the Hardest Hit Fund, that could pay all delinquent residential tax bills in Detroit and prevent tens of thousands of persons from being evicted. Instead federal funds are directed towards demolition of blighted homes, while allowing foreclosed homes to become blighted. 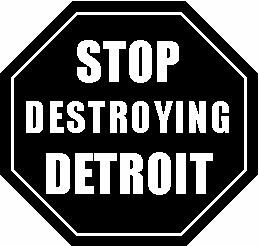 The Wall Street banks and others who destroyed Detroit neighborhoods through documented racist predatory loans should pay for the blight – they caused it! In the least, the federal funds could pay off delinquent residential property tax bills and then be used by the City of Detroit for blight removal after receipt of the tax payments. Stop all foreclosures and evictions of occupied homes. Reassess all residential property taxes. Direct all of “Hardest Hit” money for saving people’s homes, not blight removal. Hold banks responsible for targeting Detroiters using racist predatory loans. Restore City of Detroit retiree pensions and health benefits. Almost $6 billion was stolen from pensioners in Detroit’s bankruptcy. Stop the water shut offs now! Restore water service to those earlier cut off. Implement the Water Affordability Plan of 2005. Water is a human right! Recover the $537 million in predatory and coercive swap termination fees paid to big banks in 2012 using badly needed infrastructure repair funds! No to water rate increases! Get the union-busting, privatizing, and profit-taking Veolia corporation out of the Detroit Water and Sewerage Department.